Housetraining a puppy requires keeping it in a "no mistake" zone where a puppy can do no wrong when it is not being supervised. For easy cleanup, every part of the surface area in the confinement area should be completely covered with wee wee pads or paper in case the puppy does go potty. Confinement areas can be created with exercise pens that surround a bed or attach to a crate, and they can also be created by setting up gates that can turn a bathroom or hallway into a makeshift confinement area. This is the perfect setup whether you choose to indoor OR outdoor potty train a puppy. Those wanting to indoor potty train simply need to take away some of the potty pad tiles one by one as they notice where their puppy has started to go potty (perhaps after one or two weeks). Usually, the puppy will target the same area, so eventually, there can be only one pad acting as a legal indoor toilet. Housetraining requires going on a schedule and supervising a puppy anytime it is roaming free in the house. And in fact, one of the real secrets to potty training is ONLY letting a puppy roam free in the house after it has gone potty in the right spot. The biggest game-changer is keeping a puppy on a leash until they potty before letting them off to roam free in the yard or in the house (or even before taking them for a walk). This requires more patience in the beginning but really pays off quickly as a puppy starts to understand that they win their freedom (or a chance to go on a walk) after they've pottied. 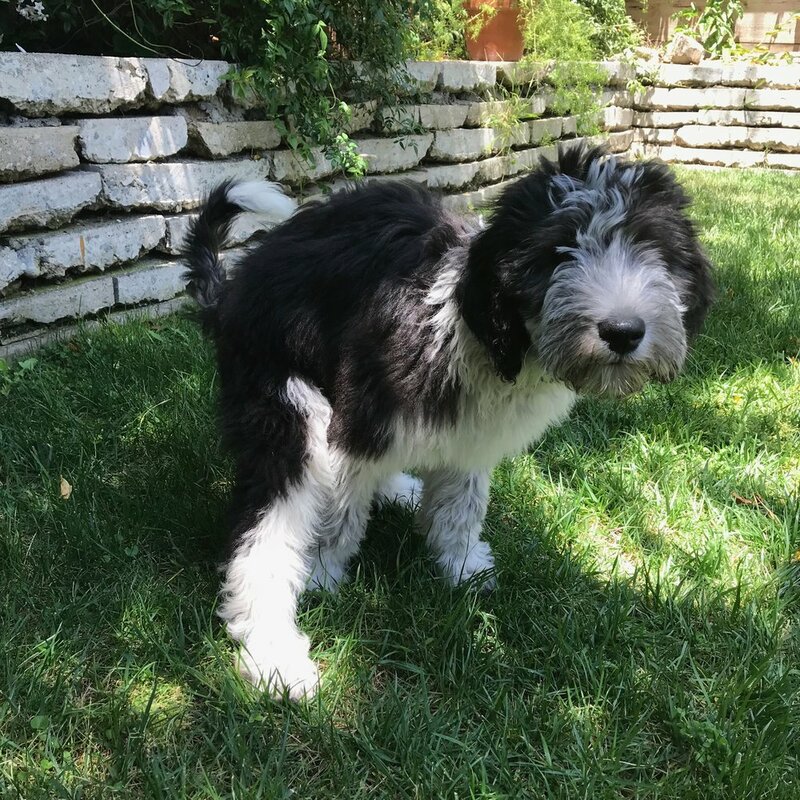 The process is simple: If you're taking your puppy outside to potty, just stand in one spot and give your puppy the length of the lead to sniff around until they decide to do their business. Once they do, let them off for a romp (or begin your walk). If you're pee pad training your puppy, simply put the lead on them and wait for them to potty on their pee pad before removing them from their playpen, and voila! Your puppy starts to understand they need to empty their system before being allowed to join you for playtime. Soon, the leash won't even be necessary--you'll notice your puppy will potty for you as you appear near their confinement area so that they can quickly exit their pen. Prevention is worth an ounce of cure. That's why it's a good idea to stick to a limited "roaming-free" schedule, meaning that you will only let your puppy roam free for about 20-45 minutes before putting them back in their "no mistake" zone. This also gives a puppy parent a break to go back to doing other things without worrying about what their puppy is up to. The side benefit of this strategy is that it helps to avoid separation anxiety from developing. Your puppy gets used to learning how to entertain themselves by not always being with you, and as a result, they can better tolerate being left alone as they mature. Within 5-30 minutes after eating a meal (usually a puppy will have to pee right after eating, and pooping may happen within 15-30 minutes after a meal). After any period of stimulation like playtime with people or another dog or meeting a new guest that is visiting. If the puppy feels overly-excited or anxious for any reason, it may lose its bladder control (like after hearing fireworks for the first time or when meeting a new guest). Before putting puppy to bed at night, it's important to take them for a final bathroom break. Young puppies will often need a bathroom break in the middle of the night between midnight and 3-4pm. NOTE: Young puppies before they have bladder control may have to potty as much as every 20-30 mins, so keep this in mind! When a puppy is roaming free in the house, they must always be supervised so that they can be instantly corrected should they decide to go potty in the wrong spot. If this happens, simply pick them up, say "Oops! ", and then take them directly to their potty spot to finish their poop or pee. If they don't finish their potty, but you suspect they still have to go, return them to their no-mistake zone to ensure they don't make a mess in the wrong spot again. Then make a point to take them to their correct potty spot within 5-15 minutes to finish their potty. This strategy also frees you up to attend to other things and not worry if your puppy makes a mess when you're not attending to them. Never punish a puppy for making a potty mistake. If you punish your puppy for doing something as natural as going to the bathroom, they will only learn that it's not okay to potty in front of you. Often, the fallout from punishment is that a puppy learns to get sneakier about when and where they decide to go potty, so you will only end up finding little wet or smelly gifts from your puppy tucked "safely" out of sight. 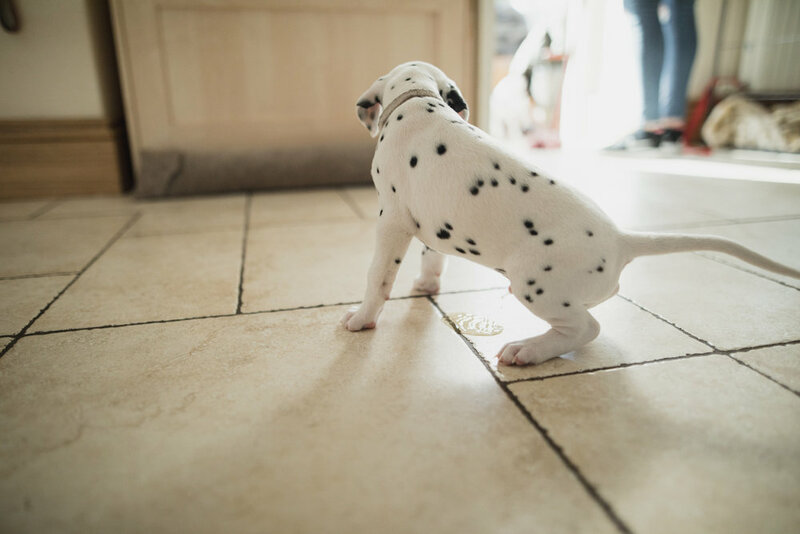 If your puppy goes potty in the wrong spot on your watch, you need to examine how to refine your potty training methods and do better supervising them the next time. As the human with a bigger brain, it falls on you to adopt the right measures to train your puppy properly--no exceptions! Alexandra Bassett is the owner and lead dog trainer at Dog Savvy Los Angeles, a dog training company that specializes in positive training and solving problem behaviors like dog separation anxiety, leash reactivity, and aggression. She is certified as Knowledge Assessed by the Council of Professional Dog Trainers (CPDT-KA) and is available for online dog training sessions via Skype.